Even before airline restrictions required us to dramatically curtail our loads, packing has never been the best part about traveling. For cosmopolitan jet-setters with no time to fuss, Renée Lacroix and Zahra Ash-Harper have devised the "Carry-On Closet," a trans-seasonal 10-piece capsule collection designed for versatility, comfort, and style on the go. Inspired by slow-fashion principles, the London College of Fashion students designed each piece to function in multiple ways: a cape becomes a one-shoulder blouse or skirt, a dress morphs into a top, and a coat unzips into a cropped jacket or vest. The best part? Everything packs into a cabin-size suitcase. By creating garments that do more with less, Lacroix and Ash-Harper aspire to whittle the prodigious amount of textile waste that enters landfills each year, not to mention the fashion industry’s sizable water-and-energy footprint. “Most people are familiar with the principle ‘reduce, reuse, and recycle,’ but not everybody is aware that it’s a three-step pyramid where most of the impact happens at the base: to reduce,” Lacroix tells Ecouterre. Lacroix and Ash-Harper aspire to reduce the prodigious amount of textile waste that enters landfills each year. The pair came upon the idea after acquainting themselves with the concept of modular clothing in Sustainable Fashion and Textiles by Kate Fletcher. Although the book suggested the use of detachable components to reduce the need to launder an entire garment, Lacroix had a different context in mind. An avid traveler, Lacroix has plenty of firsthand experience with the quandaries of modern travel. How does one avoid being dinged for an extra suitcase without sacrificing your essentials (or not-so-essentials), for instance? “It was a real eye-opener on the need to travel light and about the kind of garments I wish I owned in that situation,” she says. Together with Ash-Harper, Lacroix founded Antithesis—a “multifunctional womenswear fashion label with ethical intentions”—that will debut with the Carry on Closet this fall. Based on the constructivists’ use of geometric shapes, particularly the circle and the square, the designs are characterized by adjustable drawstrings, non-fraying materials (to minimize finishing), removable parts, and a consistent palette that allows for easy mixing and matching. 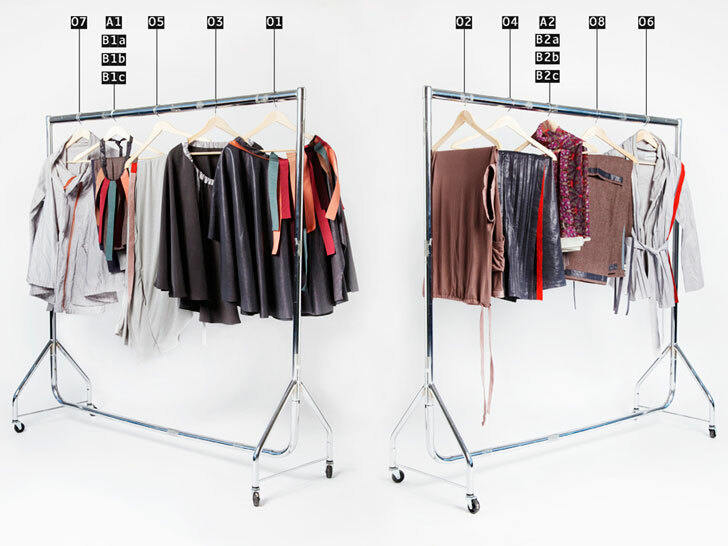 You don’t have to be a nomad to enjoy the benefits of a multifunctional closet, of course. By creating garments that do more with less, Lacroix and Ash-Harper aspire to whittle the prodigious amount of textile waste that enters landfills each year, not to mention the fashion industry's sizable water-and-energy footprint. “Most people are familiar with the principle 'reduce, reuse, and recycle,' but not everybody is aware that it’s a three-step pyramid where most of the impact happens at the base: to reduce,” Lacroix tells Ecouterre. The pair came upon the idea after acquainting themselves with the concept of modular garments in Sustainable Fashion and Textiles by Kate Fletcher. Although the book suggested the use of detachable components to reduce the need to launder an entire garment, Lacroix had a different context in mind. An avid traveler, Lacroix has plenty of firsthand experience with the quandaries of modern travel. How does one avoid being dinged for an extra suitcase without sacrificing your essentials (or not-so-essentials), for instance? "It was a real eye-opener on the need to travel light and about the kind of garments I wish I owned in that situation," she says. Together with Ash-Harper, Lacroix founded Antithesis—a "multifunctional womenswear fashion label with ethical intentions"—that will debut with the Carry on Closet this fall. Based on the constructivists' use of geometric shapes, particularly the circle and the square, the designs are characterized by adjustable drawstrings, non-fraying materials (to minimize finishing), removable parts, and a consistent palette that allows for easy mixing and matching. To reduce the number of metal components, the duo used buttonholes instead of eyelets on drawstring channels. Each piece is designed to be worn in several ways. With the use of invisible zippers, a double-crepe silk skirt can be worn as a draped top, a cape, culottes, a halter-neck blouse, or a mid-sleeve blouse. For trim, Lacroix and Ash-Harper applied salmon leather, a waste by-product of the fish-processing industry. Multifunctional garments that address the need of a specific target market—frequent travelers, in this instance—will contribute to a "new consumerism philosophy advocating quality over quality," says Lacroix. You don't have to be a nomad to enjoy the benefits of a multifunctional closet, she adds. "With an increasing percentage of the global population living in large cities, most workers need to transit for long periods, making it very difficult to go back home in between activities," she says. "[We're] targeting urban, busy professionals seeking a simpler lifestyle."